My blog post for my stop on the blog tour for ‘A Thimbleful Of Hope’ is slightly different in that it comes in two parts. 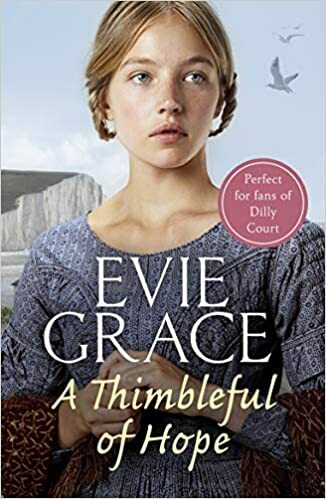 The first part contains my review and the second part (this part) features an interview with Evie Grace herself. Who or what has inspired you to write the ‘Maids Of Kent’ series and your latest book? (‘A Thimbleful Of Hope)’? I was inspired to write A Thimbleful of Hope and the ‘Maids of Kent’ series by fond memories of Kent and the history of my family, passed down by word of mouth through the generations, and researched and recorded by my dear dad. I was born in Whitstable and spent many happy hours with my grandparents, visiting Dover Castle and looking out across the White Cliffs to watch the ferries coming in and out of port. Having done a little research into Dover’s maritime past, with its flourishing cross channel trade and the introduction of the steam-packets for transporting the mail, I decided that I had to set A Thimbleful of Hope in this historic town. Why did you set your new book ‘A Thimbleful Of Hope’ when you did? Violet’s story is set in the 1860’s among the gas-lit streets of Dover. I chose this era because it was a time when great changes were happening, both in society and in industry. Violet’s father has taken advantage of the opportunities available and invested in shares in one of the railway companies that were competing to dominate the town. Although the family live in comfort, Violet is trapped by her upbringing and the expectations of society in the 1860’s. When a woman marries, her property and any wages she earns legally belong to her husband, something that didn’t change until 1870. If I’d set A Thimbleful of Hope in another decade, Violet’s story would have been quite different. From having the kernel of an idea to the finished novel, it takes me about six months. I plan like mad to keep to my schedule, putting aside twelve weeks for research and writing the first draft, followed by six to eight weeks for editing before I send it to my lovely editor at Arrow. Have you got any other series or books in the pipeline? I’m already planning a series of three more books, but the details are still under wraps. That’s a difficult question – there are so many! I suppose I would have to say Pride and Prejudice. I didn’t appreciate it when I first read it at school, but it’s now one of my favourite novels. I love Jane Austen’s use of language and her observations of social situations – and Mr Darcy, of course. I’m not very good at relaxing. Because I spend my working hours, sitting at my desk, I like to be active during my free time. Last summer, I moved to my dream home in Devon where my partner and I are looking after five acres of pasture and ancient woodland, so when I’m not writing, I’m moving logs, planting trees and clearing scrub. I’ve also been out looking for bats, identifying fungi and measuring trees, the oldest one working out to be about 270 years old. There are too many to list, but I’d include Nancy Revell, Elaine Everest, Margaret Dickinson and Jean Fullerton. Which 5 people (either dead or alive) would you invite to a dinner party and why? I’d invite Queen Victoria – I would have loved to have met her to find out what she was really like. I’ve read that her fellow diners would often go hungry because they were obliged to stop eating when she did, and she ate very quickly. I’d also ask Ariana Grande, Michelle Obama and two other strong and resilient women, my grandmothers. My father’s mother was born in 1896 and lived into her nineties. Although she saw many changes, including the arrival of the car and advances in medicine, I can’t help wondering what she’d think of the world today. I hope you enjoy reading A Thimbleful of Hope as much as I loved writing it.